A while ago, I rambled on about the lamentable state of DC Comics’ collected reprint editions, particularly the operpriced, overblown and overproduced Archives Series. While there’s still a flood of those books coming, it does appear as if DC is starting to rethink how it’s handling its vast library. The Batman Chronicles Volume One represents a big step in the right direction. This 192 page paperback begins the mammoth undertaking of chronologically reprinting every Batman tale from every comic in which he starred, beginning with “the Case of the Chemical Syndicate” from Detective Comics #27 (dated May, 1939). The Good: The paper is cheap (a traditionalist, I prefer my comics on matte paper and with gutters! ), the price is low ($14.99) and the quality is good. The design of the book is nice and the reproduction is pretty crisp. The Bad: The physical size of the book is (like the Archives) disproportionate to the original comics, leaving huge margins at the top and bottom of the page while forcing the art too close to the spine. 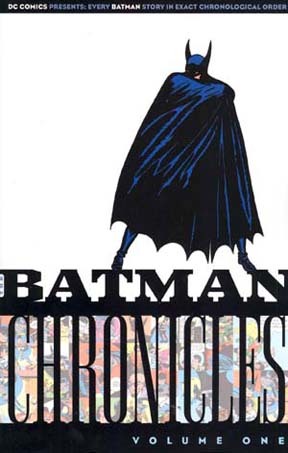 The art is still being recolored and worst of all, there’s a distinct absence of historical perspective; The Batman Chronicles lacks even a cursory introduction. The book opens with a table of contents (that thankfully gives writer and artist credits), and does reprint the covers along with the stories, but some more context would be appreciated. No doubt, DC is trying to squeeze as many stories as possible into each volume to make the books economically feasible to the fanboys (especially the obsessive ones who already own the Archives... yes, there are some who will buy both). But I’d still love some additional material such as editorial comment on the tales, reprints of advertising (and the “full page autographed picture, suitable for framing” from the back cover of Batman #1) and biographies of the creators (which DC almost always includes in its collections). It would seem that if a little more effort were put into discussing WHY these stories are so important in the history of comics, what their contemporaries and competition were, what the country was going through at the time, the books might appeal to a wider audience than the already oversaturated fan market. After all, this was the darkest Batman of all (at least before Frank Miller got his hands on him )... he used a gun, he killed his enemies, he was wanted by the police, he was a loner.... until the introduction of Robin, the Boy Wonder in the twelfth story herein. The tone lightened a bit, but the Joker was still terrifying instead of funny and the stories retained a noir feel that would alter dramatically as the forties rolled on.